(a) Install the 2 thrust washers to the side gears. (b) Install the side gear to the differential case. (c) Install the 4 pinion gears and thrust washers to the spider. (d) Install the spider assembly to the differential case. HINT: Install the spider to the differential case tightly. (e) Using a dial indicator, measure the side gear backlash holding the side gear and spider. 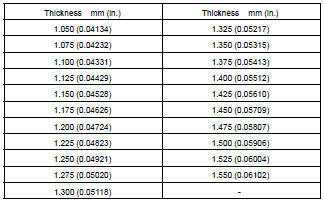 Measure the backlash at the RH and LH differential cases. If the backlash is not within the specified value, install a thrust washer of a different thickness. (a) Reinstall the spider to the differential case. (b) Align the matchmarks and assemble the RH and LH differential cases. (c) Tighten the 8 bolts uniformly, a little at a time. (a) Using SST and a press, install the RH side bearing on the differential case. (b) Using SST and a press, install the LH side bearing on the differential case. (c) Heart the ring gear to about 100 C (212 F) in boiling water. (e) After the moisture on the ring gear has completely evaporated, quickly install the ring gear to the differential case. (h) After the ring gear cools down enough, torque the 12 set bolts to which thread lock has been applied. (b) Install the differential case onto the carrier and tighten the adjusting nut just to where there is no play in the bearings. (c) Using a dial indicator, check the ring gear runout. Make sure that the right and left outer races are not interchanged. (b) Install the differential case in the carrier. HINT: Make sure that there is backlash between the ring gear and drive pinion. Install the 2 adjusting nuts on the carrier, making sure the nuts are engaged properly. Align the matchmarks on the bearing cap and carrier. Screw in the 2 bearing cap bolts 2 or 3 turns and press down the bearing cap by hand. HINT: If the bearing cap does not fit tightly on the carrier, the adjusting nuts are not engaged properly. Reinstall the adjusting nuts if necessary. (a) Torque the 4 bolts. (b) Then loosen them to the point where the adjusting nuts can be turned by SST. (d) Using SST, torque the adjusting nut on the ring gear side until the ring gear has a backlash of about 0.2 mm (0.008 in.). (e) While turning the ring gear, use the SST to fully tighten the adjusting nut on the drive pinion side. After the bearings are settled, loosen the adjusting nut on the drive pinion side. (f) Place a dial indicator on the top of the adjusting nut on the ring gear side. (g) Adjust the side bearing to zero preload by tightening the other adjusting nut until the pointer on the indicator begins to move. (h) Using the SST, torque the adjusting nut 1 - 1.5 notches from the zero preload position. (i) Using a dial indicator, adjust the ring gear backlash until it is within the specified value. HINT: The backlash is adjusted by turning the right and left adjusting nuts by equal amount. For example, loosen the nut on the left side 1 notch and torque the nut on the right side 1 notch. (j) Torque the 4 bearing cap bolts. 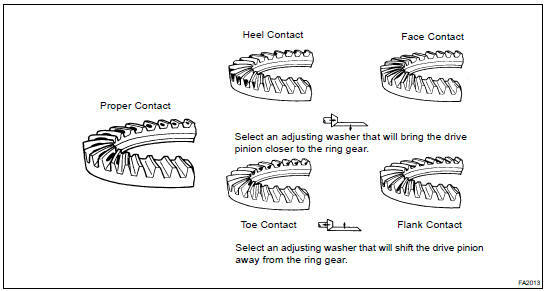 (k) After rotating the ring gear 5 turns or more, recheck the ring gear backlash. (b) Using SST and a hammer, install the oil seal. (a) Install 2 new nut locks on the bearing caps. (b) Tightening 2 bolts, bend the nut locks. 29. REMOVE DIFFERENTIAL CARRIER FROM OVERHAUL STAND ETC.